is a PhD candidate at the Donders Institute and the Max Planck Institute for Psycholinguistics in Nijmegen in the Netherlands. He writes on psychology, cognitive neuroscience, language and music. Imagine yourself at a concert hall looking at a symphonic orchestra on stage. Have you ever noticed that high-pitched strings sit left of low-pitched strings? Going from left to right, one usually sees violins, violas, cellos and double basses. That is, one moves from high pitches on the left to low pitches on the right. Why? The orchestra’s arrangement is not a cultural oddity, like driving on the right side of the road. Rather, it is due to our own biological makeup. Higher pitches tend to be better processed by the left hemisphere of the brain, while lower pitches tend to be better processed by a similar region in the right hemisphere. This organisation is thought to have repercussions far beyond music, perhaps even helping to explain why language is mostly processed in the left hemisphere. So the part of my brain that better processes high sounds sits where the higher-pitched instruments sit: on the left. But that’s not the end of the story. Confusingly, left-right differences outside the brain usually cross and become right-left processing in the brain. For example, the violinist you see on stage holds her bow with the right hand – which is controlled by her left brain hemisphere. When she looks at the music score, the right page will be projected to her left brain hemisphere’s visual cortex. I once vividly experienced this curious fact about the brain when my motor cortex on one side was stimulated with magnetic waves causing the index finger on the other side to start moving. How humans evolved such a confusing brain organisation is largely unclear. We share the left-right crossing with other vertebrate species, so it is not linked to anything uniquely human (such as our ability to produce language). Instead, the crossing probably goes back to an ancestor who lived several hundred million years ago in the sea. For some reason, this ancestor evolved in a way that turned parts of its head 90 degrees one way and the body 90 degrees the other way. The result is an overall 180 degree turn: right becomes left and left becomes right. This left-right crossing has a strange consequence for modern humans listening to an orchestra. The right ear hears high-pitched notes better, which projects to the left auditory cortex. For the listener, this is situated on the wrong side in order to optimally hear high-pitched instruments, sitting mostly to the left. The orchestra seating arrangement doesn’t take the audience’s brains into account, which prefer higher pitches from the right. In which ear did you hear the high melody? Now, reverse the headphone positions and play the same audio file again. In which ear do you hear the high melody now? If you truly have a right ear advantage for high tones, then the answer to both questions should have been the right ear. Finally, play the audio again but plug in only one of the earphones. As will be obvious by now, during the illusion you actually heard high and low tones in both the right ear and the left ear. But your brain reorganised the location because of biases brought about by brain organisation. If the right ear hears high tones better, why are high-pitched instruments located on the left? It is for the benefit of the musicians themselves. They must carefully listen to each other in order to play together. Therefore, they sit in an optimal position with high pitches on the side of the body that better hears higher pitches. Curiously, this is to the (small) detriment of the listener. 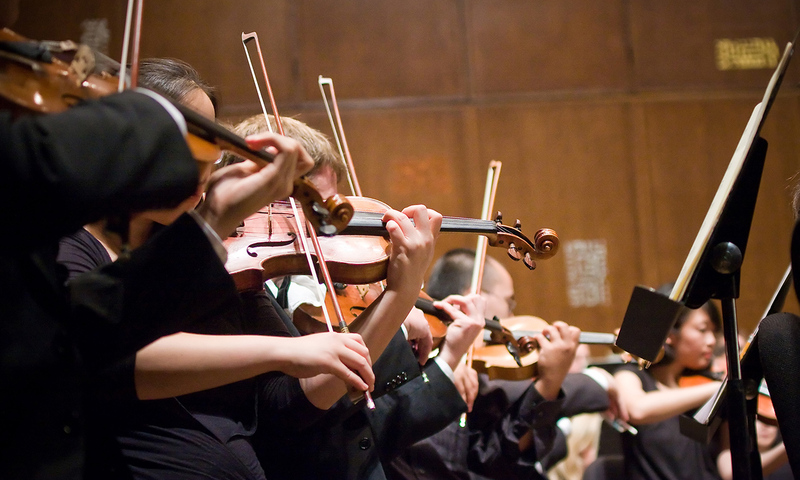 The seating arrangement of modern orchestras mirrors the listening bias of human ears. The ears project to the opposite brain hemisphere’s auditory cortex, which is where the listening bias originates. In this way, the seeming cultural oddity of who sits where in an orchestra could actually be the result of a biological oddity of brain organisation. It is not just a historical accident akin to driving on the right or left. In the concert hall, the cultural and the biological are closely intertwined.